According to oral tradition documented for several tribes of the Degiha branch of the Siouan language family, as well as initially sporadic accounts by Europeans — from the 16th and 17th century on — the Degiha tribes (Omaha, Ponca, Osage, Kansa, Quapaw) migrated from their ancestral homeland and reached their latest homelands some time probably between the 18th century and the beginning of the 19th century. There will have been certain time variations between tribes regarding their final locations. About the position of their ancestral homeland there appear to be two hypotheses: one sees it west of the Great Lakes, the other at the mouth of the Ohio River. Initially, the Degiha cognates seem to have been a single tribe, according to Ritter (2002) called arkansa or alkansa by the Illinois tribes. Another account apparently well-supported by linguistic evidence states the name of the ancestral tribe as hõʔgɑ or hãʔgɑ. It is not known what circumstances dislocated the hãʔgɑ and made them change their habitat of woodland for the great plains - it was speculated that climate change might have played a role like the cold and dry period culminating around 1200 A.D. and ending around 1400 (the Little Ice Age). Ritter relates that according to Ponca told history, the tribes travelled down the Ohio to the Mississippi. There they separated to the "downstream people" (which were the later Quapaw) and the "upstream people" (see the map). The greater group travelling upstream remained for some time in the area of today's St. Louis before they continued westwards and upstream along the Missouri to the mouth of the Osage River. There the next separation took place. "The Omaha and Ponca crossed the Missouri River and left the Osage and Kaw [Kansa, note by S.B.] behind." Ritter (2002: 275). They went north to the sacred pipestone quarries in Minnesota, but were driven away by Dakota and drifted south-west where they encountered further trouble with Dakotan tribes. 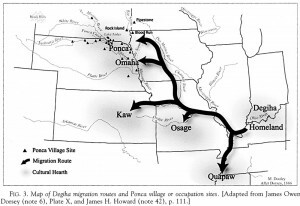 From the point of the separation from the Osage and Kansa the story related by Ritter becomes rather detailed, but only concerns the Omaha and Ponca, therefore I will create a separate post for the Omaha and Ponca migration history. 1541 Hernando deSoto The Quapaw already separated from the other Degiha on the lower Mississippi. 1673 Louis Jolliet, Father Jacques Marquette Omaha (and possibly Ponca) and Ioway on the Des Moines River. 1695 Pierre-Charles Le Sueur The Omaha near the Missouri River, joined by the Ioways. 1701-1702 Le Sueur / [Mildred Mott Wedel] The Omaha residing in a large village on the Big Sioux River. 1,200 Omaha families + 300 Ioway and Otoe families living at the site. 1702/1703 Guillaume de l'Isle Map placing the Omaha near the mouth of the Big Sioux River in north-western Iowa. 1720 [O'Shea and Ludwickson] The Omaha established Bad Village on Bow Creek in northeastern Nebraska. 1750 [O'Shea and Ludwickson] The first Ponca villages near the confluence of the Niobrara and Missouri Rivers. 1758 [O'Shea and Ludwickson] Omaha population dropped by 800 vs. their number in the year 1700, which could be the roughly the number of Ponca who may have departed. 1786 [James Henri Howard] A French map identified the Ponca on the Missouri River, near Ponca Creek and the Niobrara River. 1789/1793 Jean Baptiste Monier Traded and lived with the Ponca. He was the first European who actually was in a Ponca settlement and left a written account. 1794 Jacques Clamorgan Located the Ponca "on the bank of the Missouri about thirty leagues above the village of the Maha [Omaha] nation." 1794-1795 Jean Baptiste Trudeau Opened a trading post that came to be known as the "Ponca House" on Ponca Creek near the Missouri. 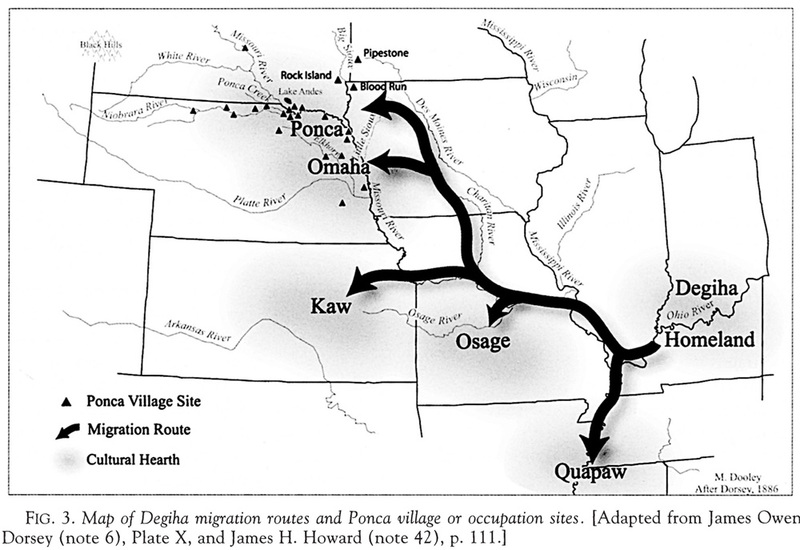 This entry was posted in Kansa (Kaw), Migration, Omaha, Osage, Ponca, Quapaw and tagged archaeology, Degiha, history, map, migration. Bookmark the permalink.